For although there is nothing esoteric in his [F.M. Alexander’s] teaching, and although his exposition is made in the simplest English, free from technical words, it is difficult for anyone to grasp its full force without having actual demonstration of the principle in operation. To know, in John Dewey's sense of the word, what the Alexander Technique is about, it is important to actually experience it. Dewey took private Alexander lessons over a period of 35-plus years. Lessons in the Alexander Technique give the student the opportunity to make in-depth improvement and to develop substantive skills in stopping and changing habits. During an Alexander Technique lesson, the teacher takes the student through basic movements while giving gentle hands-on guidance. Through this guidance, the student experiences more natural and easy movement without the on-going intereference of habits. Repeated experiences of natural fundamental coordination, combined with verbal instruction, give the student the opportunity to make lasting habit changes. Small classes and workshops can serve as an adjunct to individual lessons or an introduction to the Technique. F.M. Alexander taught and recommended individual private lessons. Benefits of Alexander lessons can include easier and more efficient movement, improved posture, the development of poise, freer breathing, increased vitality, and more reliable kinesthesia. Lists of certified teachers are available from the Society of Teachers of the Alexander Technique (STAT), and the American Society for the Alexander Technique (AmSAT). Standard criteria for Alexander Technique teacher-training were established over eighty years ago by F. Matthias Alexander. Qualified teachers have completed full-time courses that meet the three-year, daily training class standards established by F. M. Alexander. F.M. 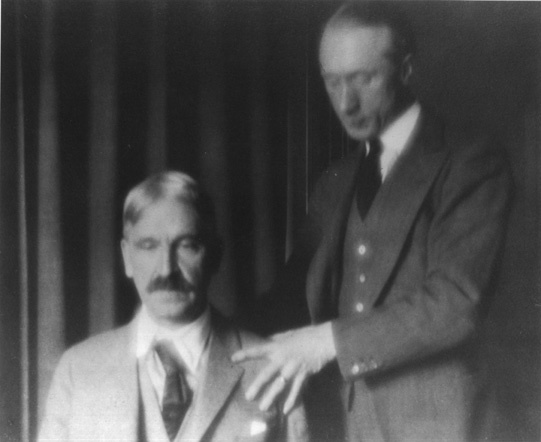 Alexander (right) giving John Dewey an Alexander Technique lesson.